Recap: In what was widely predicted before the match, Palestine dominated proceedings from the outset. Their dominance, reflected by possession numbers that hovered above 70% for the opening 30 minutes, did not result in goals and the match soon fell into a cycle of Palestinian attacks and Nepalese clearances. When chances did fall to Palestine, both Sameh Maraaba and Khaled Salem failed to convert. Palestine's best chance of the first half fell to Hilal Mousa who crashed his effort against the right post. 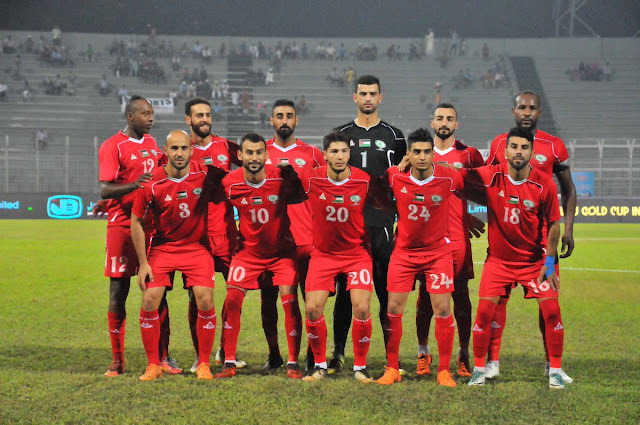 To their credit, Nepal limited their defensive mistakes and an organized backline frustrated Palestine who were made to settle for a scoreless draw after 45 minutes. Looking to change the state of affairs, Ould Ali pushed his midfield further up the pitch and had Sameh Maraaba play next to Khaled Salem. Looking for added attacking impetus, Musab Al-Battat came on in the 55th minute for Michel Termnaini. That change sparked Palestine into life, but Nepalese goalkeeper Bishek Kuthu came up big on multiple occasions to prevent Palestine from a deserved lead. Palestine got their breakthrough in the 70th minute when Khaled Salem headed home from close range following a pinpoint cross from Abdallah Jaber. Palestine would see out the rest of the match with minimal fuss- missing half a dozen chances to further extend their lead. What I liked: Mohammed Basim. What a gem this player is, he covers so much ground and seems to anticipate danger before it happens. Friendlies might not be in vogue at the moment but they do give an opportunity to test out new players. Two months ago, Basim had not played a game with the national team- now he's in contention to start in the UAE. In the larger scheme of things, other than the tournament format- this may not be the best way to prepare for the Asian Cup but it does prepare the team for the next phase of qualifying. It's never easy to win on the road in Asia and if Palestine wants to make a serious run at qualifying for the 2022 World Cup they'll need to win find different ways to win games. What I didn't like: To potentially play four games in eight days is tough on any team. That said, it does raise the question as to why the squad wasn't put together with that fact in mind. The likes of Fadi Salbees or Musa Farawi could have been included to give the full backs a break in this game. Instead, we saw Termanini deployed out of position. Moreover, it would be nice to see players suffer the consequences for poor performances. Tamer Salah was atrocious in the last two games he started- so why not trot out Yazan Owaiwi? The same goes for Toufic Ali- this should have been Khaled Azzam's international debut. Sameh Maraaba's constant presence is also cause for concern. He went missing too many times today and when he did pop up, it often resulted with him steering a goal bound effort straight at the goalkeeper. Finally, if there was any game to depart from the 4-2-3-1 shape, it was this one. Playing with a lone forward- especially one so far down the depth chart- made it easier for Nepal to neutralize our goal threat in the first half. What's Next: Palestine will play Bangladesh on Wednesday, October 10th at 12:30 PM Jerusalem Time.